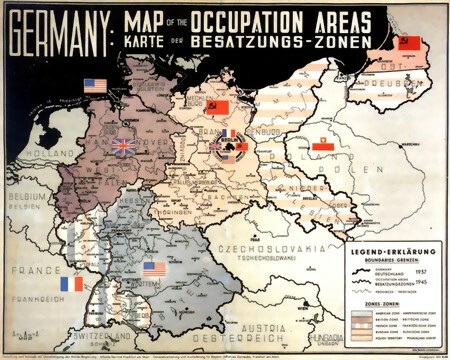 The guns have fallen silent in Europe; the Western Allies have consolidated control in their zones. The Wochenschau reports with their introductory music from Liszt's Les Preludes are no longer broadcast. But a new propaganda has replaced the Deutsche Wochenschau; it's the newsreels of the Allied conquerors: Welt im Film. Discounted 3 DVD subtitled set of Europe in Ruins, long available in our webstore (and still available for those who don’t need subtitles). The set opens with the last Wochenschau newsreel of March 1945, which is then followed by a Red Cross appeal of children looking for their missing parents. Finally, the remainder of the set consists of newsreels put out by western Allies in their sectors of occupied Germany in 1945 (from May till October). FILM QUALITY: variable, but mostly soft quality.